Earlier this year Wil had the pleasure of heading out to Spain for the launch of the new Specialized Stumpjumpers. 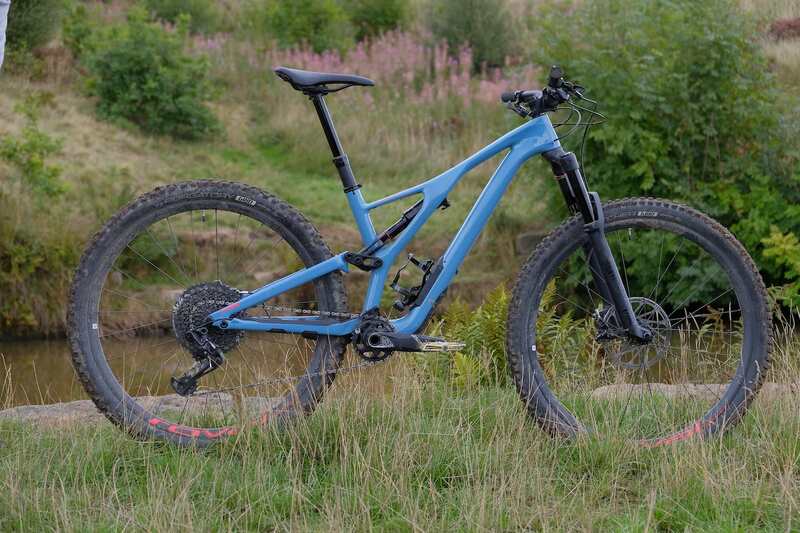 We’ve now had the Stumpjumper ST Comp Carbon 29 (130/120mm) and Stumpjumper Expert Carbon 29 (150/140mm) back on test to see how they perform on more familiar trails. Here we have Rachel reviewing the longer travel Stumpjumper. Over to Rachel! The regular Stumpjumper can be had in with 27.5in wheels (150/150) or with 29in wheels (150/140). Each platform is available with 29in or 27.5in wheels (the rear travel of each is 10mm less on the 29ers) and in a variety of build options including a “women’s” (same frame but smaller components, shock tuned for lower weights). 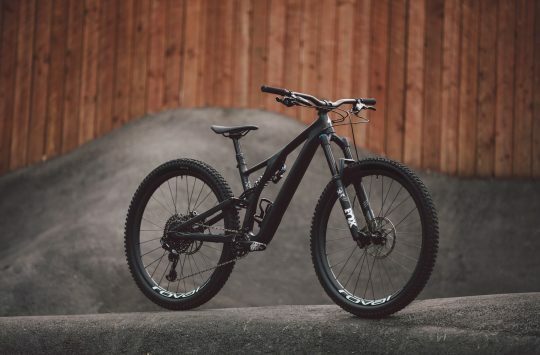 To make things a bit easier to keep track of, the women’s specific bikes like the Rhyme and the shorter travel Camber have been subsumed into the Stumpy range. The Expert Carbon is one of four models in the Stumpjumper 29er platform, and there’s an S-Works frame-only option too. Prices start at £2,500 for the Comp Alloy and top out at £8,000 for the full S-Works bike. Our Expert Carbon sits one below the S-Works and retails for £5,000. Sizes are Small to X-Large. There’s an X-Small available in the Stumpjumper range, but only with 27.5in wheels. Sitting between the Stumpjumper ST and the Enduro in terms of travel and intent, the Stumpjumper 29 is probably best described as a do-it-all trail bike. I’m used to riding bikes with 150mm travel but mostly with 27.5in wheels so I was keen to see what kind of impact the bigger wheels were going to make on familiar trails and on some bigger, more adventurous rides. The Sidearm frame design offers structural improvements for the suspension. 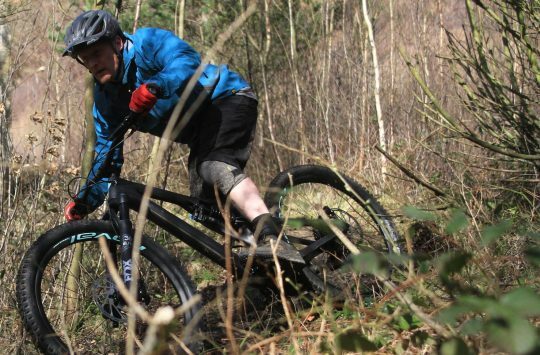 Wil has gone into lots of detail about the development of the new Stumpjumper range and specifically the Stumpjumper 140/150mm platform in his first ride review so I’ll keep it brief here. Now before going any further, I will admit that my experience of the old Stumpjumper wasn’t a great one – like many others I found it short and high and as a consequence didn’t feel I could ride it with any conviction. In comparison to its predecessor the new Stumpjumper is – as one would suspect – longer, lower and slacker. But, compared to many other modern trail bikes the geometry is still pretty modest. For the medium size tested here the reach is short at 425mm, and the stack is high at 614mm. Other key numbers include a BB drop of 33mm, a 66.5o head angle with a 51mm fork offset, and a seat tube angle of 74.5o. Nothing radical by today’s standards. Just like the Stumpjumper ST, there’s a Flip Chip at the lower shock mount that allows you to steepen the head angle by 0.5o and raise the BB by 6mm. There’s a flip chip in the lower shock mount that allows for BB and head angle adjustment. The generous standover height allows for decent length droppers across all sizes (130mm on the Small, and 160mm on M-XL sizes). 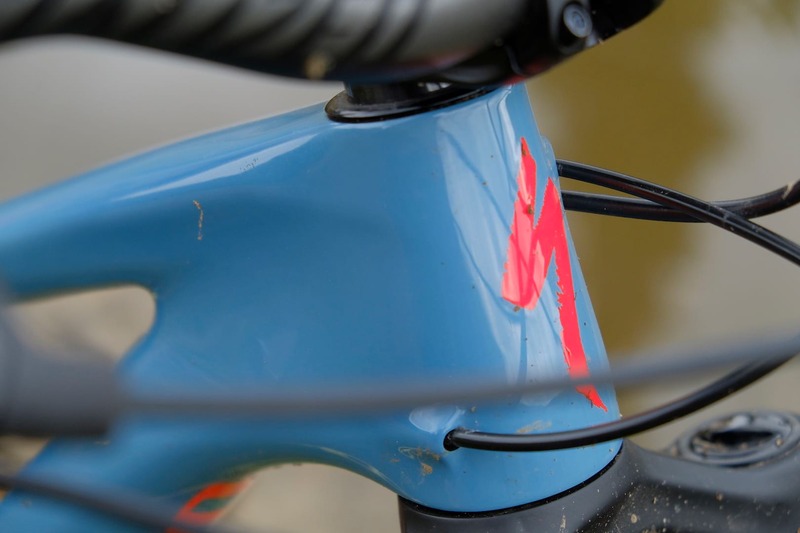 This longer post comes at a cost though, as to retain the stiffness of the short seat tube and long dropper post Specialized has increased the seat tube diameter to 34.9mm. This does limit your aftermarket choices of droppers, though as of right now there are options from BikeYoke, RockShox and X-Fusion. The Expert comes with Spesh’s own excellent Command IRcc post, which even with a slower top-out than before, still remains eye-wateringly fast. Aside from the alloy suspension linkage, the Stumpjumper Expert Carbon is made entirely with FACT 11m carbon fibre from the headtube to rear dropout. A surprisingly effective addition to the carbon frame is a thick contoured chainstay protector that has been designed to mitigate chain slap. This may seem like an unnecessary addition when you’re clattering down a rocky hillside but I was actually quite surprised at what a difference it made to noise reduction. Knobbly chainstay guard is mighty effective. Suspension is handled by RockShox, with a capable 150mm travel Pike RC up front, and a Deluxe RT3 shock out back. 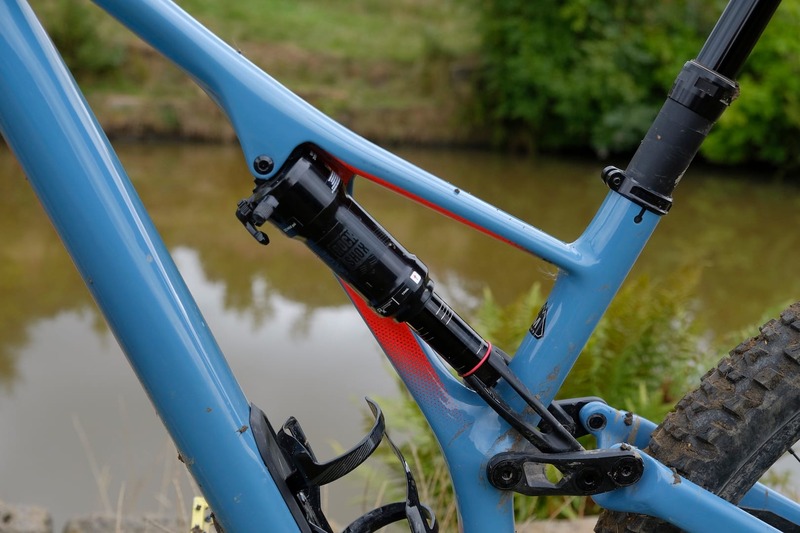 In a welcome move from Specialized, the rear shock is now a standard eye-to-eye metric shock, which means you can easily swap it out for a different shock (previous Stumpys have used a proprietary shock mount). You can even fit a coil shock if you like, since the frame will take it and the linkage rate is progressive enough. 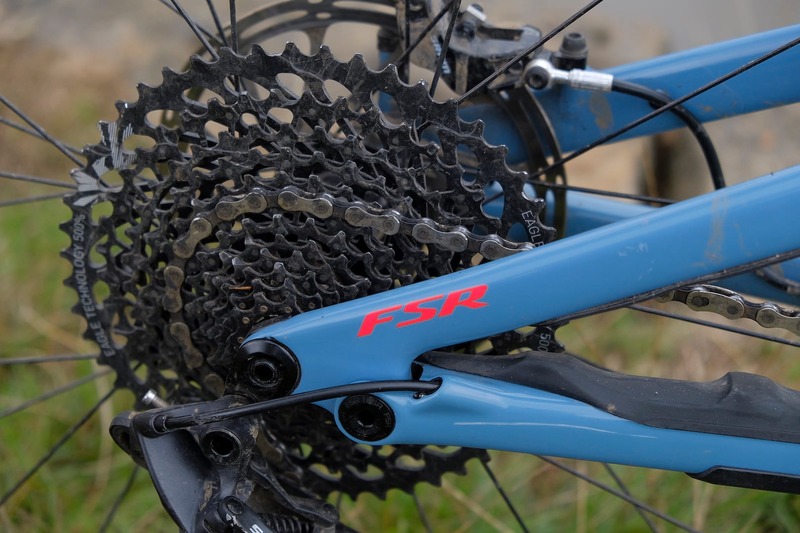 Drivetrain on the Expert Carbon is courtesy of SRAM’s GX Eagle groupset. 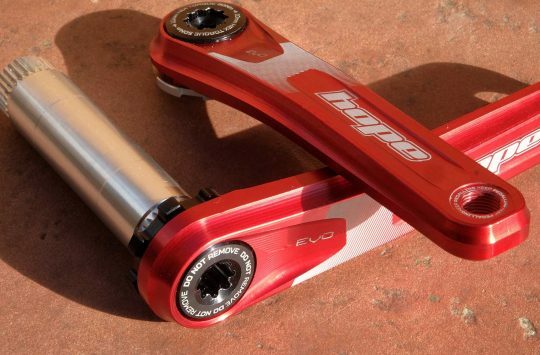 The crank length is a sensible 170mm given the propensity for pedal strikes on a modern trail bike. Gearing is pretty generous even for a larger bike with big wheels, the 30t chainring and 10-50t cassette give you plenty of crawler gears. 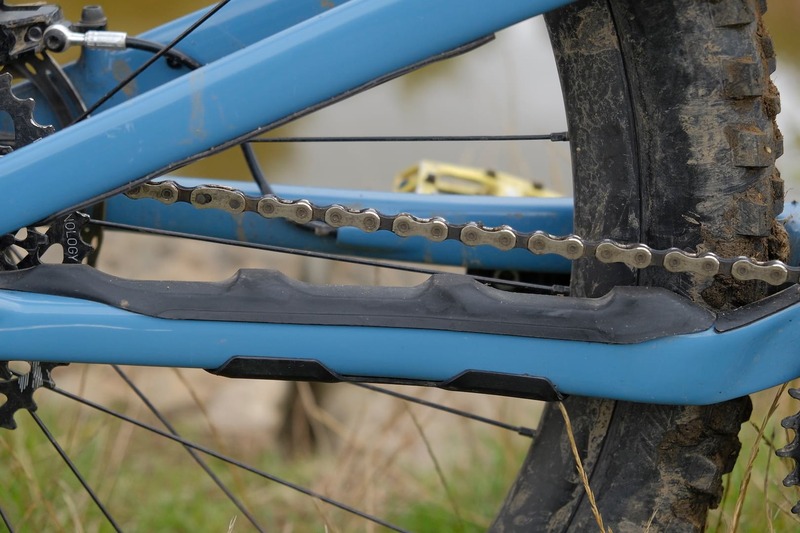 A 30t chainring is specced on all models of the Stumpjumper 29 platform as well as the ST and EVO so you get the same gearing whatever type of riding the bike is designed for (the 27.5in wheeled models have a 32t ring). It’s worth noting that if you go for the 11 speed Shimano build with a 46t cassette you will lose a gear at the spinny end of the spectrum which, depending on your climbing prowess, you may not want to do. Full carbon back end adorned with 12-speed SRAM. I’m not a big fan of the Guide R brakes. I find that the direct action piston and lack of bite point adjustment means that you lose a lot of power with the levers wound in a bit, something I need to do so my little hands can cover the gargantuan levers. For £5,000 I’d have liked to see something with more punch and adjustability. 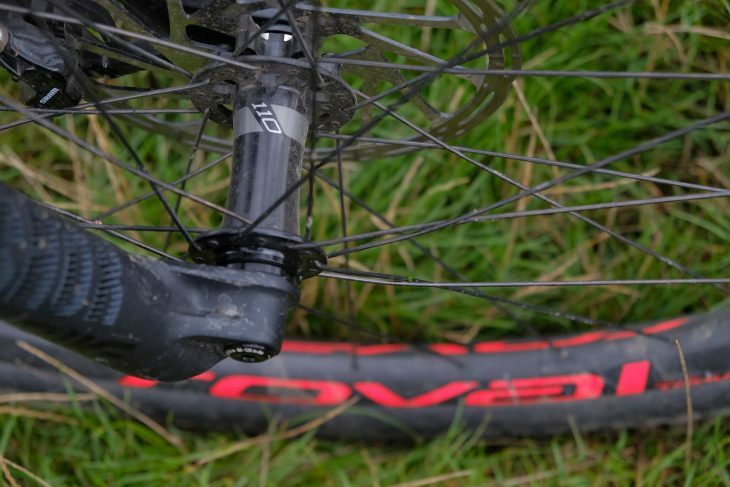 Other notable elements of the build are Roval Traverse Carbon boost wheels, which utilise DT Swiss hubs with the excellent Star Ratchet freehub. The hookless rims have a 30mm internal width. Tyres consist of a Butcher GRID up front and a Purgatory GRID out back in the new-school 2.6in width, but there’s room for a 2.8in tyre if you want to go chunkier. Roval hoops feature hookless carbon rims and thru-axle hubs. Pleasingly the press-fit BBs have gone and are replaced by a standard threaded version. Finishing kit is all from Specialized with an alloy stem (40mm on small and medium, 50mm on large and XL) and 780mm width alloy bars. Ive gone and got me one of these. Just wondering if you know more about the Roval Traverse Carbon wheel hubs? From what I’ve read online about the hubs, some are saying ‘they’re not so good’. And, some even upgrade to the Roval Traverse Carbon SL wheels with better hubs etc…? In this review, you mention that they are ‘ DT Swiss hubs using the excellent Star Ratchet free hub’. Being new to understanding wheels and hubs, it would be great if you could provide more detail on these exact hubs they’re using on 2019 Stumpy expert, as I’m considering getting this bike. I’m just a little confused to whether if these are worth keeping or upgrading right away. Thank you! Just to clarify, the Roval Traverse Carbon wheels make use of Roval’s own hub design, with the rear hub featuring the DT Swiss Star Ratchet system. In terms of the freehub itself, we’ve rarely had any issues with the Star Ratchet mechanism, which is not only used on DT’s own hubs, but across many other hub brands too. It’s simple, easy to service, and typically bulletproof. As for the bearings themselves, we experienced no issues with the wheelset on our test bike, though we only had the bike for several months through an unusually dry summer, so we can’t comment on longterm durability in wet weather. Given our positive experience, I personally wouldn’t be upgrading these wheels right away on this bike. However, if there’s a specific issue you’ve heard about with these wheels or hubs, your best bet will be to contact one or more Specialized dealers, who are likely to have more experience with this wheelset. Thoughts on this type vs. DT Star Ratchet system ?